Build fantastic websites with your favorite template languages. ERB, Haml, Markdown, Textile, and more! Serve provides the equivalent of the Views part of the Rails MVC. Partials and layouts make it possible to extract common parts of your website into reusable chunks and templates. Use helper methods to simplify complex logic. Sass & Compass, built in! Manage the chaos of your stylesheets with Sass and Compass! Sass adds features like mixins and variables to CSS. Compass provides a “standard library” of sorts or all manner of CSS wizardry. 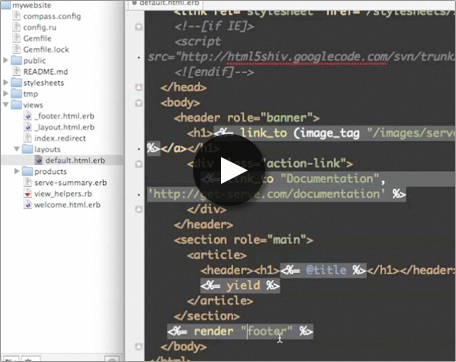 Edit and tweak your websites on-the-fly with the Serve server. And when you are ready to deploy, you have two options. Either export to a pure HTML static site or deploy the source on any Ruby-friendly web host. If you use a “Design First” workflow for your web apps you can use Serve to build working HTML prototypes (or mockups) of the finished application to test flow and design decisions, before turning it over to the developers. Since Serve uses plain text files, you can store a project in Git or any other version control system. Combine it with Textile or Markdown and you’ll achieve the perfect Content Management System for developers. Serve uses Rack and Tilt under the covers. Rack makes it possible to combine Serve with Rails or Sinatra. Tilt allows you to use Serve with almost any Ruby-based Template library. ERB, Haml, Slim, Liquid, Markdown, or Textile. Want to get the latest news about Serve? Follow @ServeApp on Twitter.